What's going on around the team and around the ballpark? 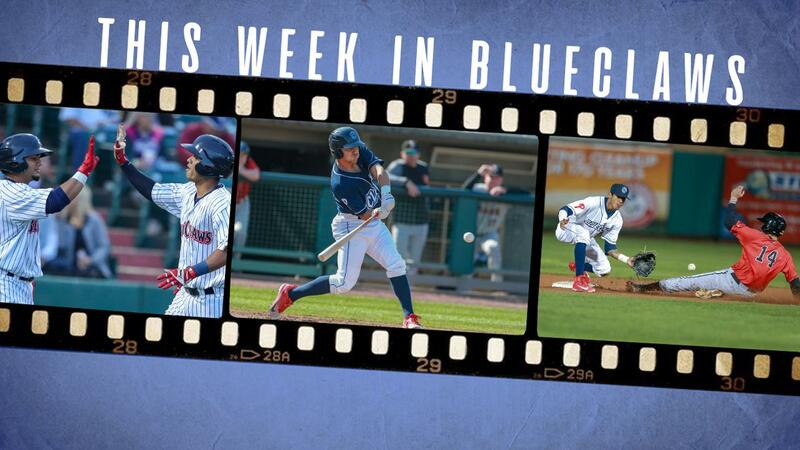 Our first This Week in BlueClaws is live! This Week in BlueClaws highlights some upcoming events, news, and other notable events related to the Jersey Shore's hometown team. Flea Market on Sunday - This Sunday, the BlueClaws will host their annual Flea Market from 8 am until 2 pm at FirstEnergy Park. The event is free for shoppers. Vendor registration begins at 6 am and is $30 per vendor. For additional information, click here. Vote BlueClaws - It's voting season, as you may know. But we are talking about voting for the BlueClaws for a MiLBY Award! We've put together a rundown of nominations - the BlueClaws are one of just three teams in all of Minor League Baseball to be nominated in six different categories. Here is the rundown we put together and you can vote here. Arizona Fall League - Week One - Over at the BlueClaws Backstage Blog, we recap week one of the Arizona Fall League looking at the former BlueClaws that are playing for Scottsdale. Darick Hall, the BlueClaws all-time home run king, homered. Read the recap by clicking here. With MiLB President Pat O'Connor - We were in Des Moines, Iowa at the annual MiLB Promotional Seminar and talked with Minor League Baseball President Pat O'Connor. Topics included the growth of that annual event, the Copa de la Diversion program that the BlueClaws will be participating in (more on that here), and MiLB's goal of 50-million fans by 2026. You can listen to the interview here. Home Runs for Heroes a Smashing Success - OceanFirst Foundation donated $78,000 to a series of military-based non-profits through the Home Runs for Heroes program. One (or two, depending on the inning) received $1,000 for each BlueClaws home run hit at FirstEnergy Park this year. Rodolfo Duran led the way with 10 FirstEnergy Park home runs. Read the full story here. Brito Wins Gold Glove - BlueClaws 2B Daniel Brito was named a Rawlings Gold Glove Award winner for all of Minor League Baseball. Read more here.